Quick overview Environmental politics is an established part of the political landscape, covering a host of different issues and impacting society, businesses, and individuals. Andrew Dobson explores the various actions, ideas, and dimensions that shape environmental politics - both on a local and global scale - and considers the role it will play in our future. Environmental politics has many faces and operates at multiple scales: it preoccupies individuals as well as governments, drives local agreements as well as international treaties, results in minor business changes as well as wholesale business decisions, and fluctuates between a politics of protest and one of accommodation. 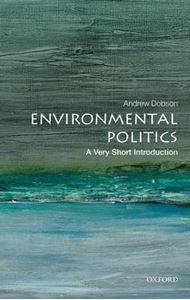 In this Very Short Introduction Andrew Dobson offers a lively and comprehensive commentary on the many facets of environmental politics today. Looking towards the future, he asks whether environmental politics will be comfortably accommodated by mainstream politics, or whether the advent of the Anthropocene - a whole new geological epoch driven by human impact on the environment - will herald a break with the politics of growth that has dominated social life since the beginning of the Industrial Revolution. ABOUT THE SERIES: The Very Short Introductions series from Oxford University Press contains hundreds of titles in almost every subject area. These pocket-sized books are the perfect way to get ahead in a new subject quickly.